Clinical trials are underway for an implantable device that delivers medication directly to the eyes of people with age-related macular degeneration. Current treatment involves eye injections every four-to-eight weeks, which is difficult to comply with and can create complications. The new technology is a tiny device that is put into the eye and lasts up to 2 years, reducing or eliminating the need for the injections. The devices are being developed by Cumberland, Rhode Island-based Neurotech. 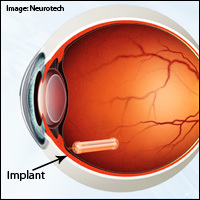 ECT is a genetically engineered ocular implant that produces therapeutic proteins. Unlike most types of genetic engineering, however, the person’s cells are not directly modified. After the implant is removed, the person is not exposed to the drug (protein) anymore. This is very different and much less risky than gene therapy, because the person’s genetic material is not changed. If the technology works out, ECT could be used for other types of eye diseases, too. Neurotech is working on treatments for retinitis pigmentosa and glaucoma using the same technology. Next: Learn about treatment updates and nutritional support for macular degeneration.